On Aug. 15, 1926, at Ebbets Field in Brooklyn, the Dodgers (or, the Robins as they were known as then) were playing the Boston Braves. The score was tied 1-1 in the bottom of the seventh inning, and Brooklyn had loaded the bases. Chick Fewster was on first, our good friend Dazzy Vance was on second, and Vance’s personal catcher, Hank DeBerry, stood on third. 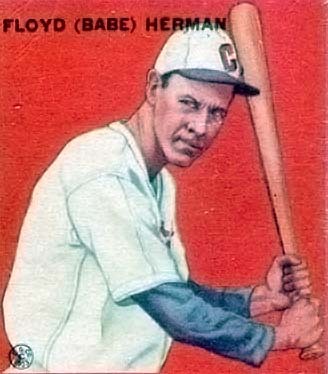 Floyd Caves Herman, better known as “Babe”, stepped into the batter’s box. Herman, Brooklyn’s power hitter, ripped a pitch to the right-field wall. DeBerry scored the go-ahead run easily. Fewster, a second baseman, sprinted from first to third and held up. Vance, unfortunately, got caught in a run down. Rather than trying to barrel over the catcher, he headed back to third base. It got awfully crowded 90 feet from home plate. Then, it got ridiculous. First, Herman slid into second base. That’s where he should have stayed. But, he watched the outfield throw go home and high-tailed it to third, his head down, undoubtedly. He remained oblivious in all ways to any shouts and signals from teammates, coaches and fans. Babe met up at third with two of his teammates. It was comical and comically heart-breaking. Eddie Taylor, Boston’s quick-thinking infielder, tagged out all three Brooklyn runners. There was already one out, but why take any chances? Umpire Beans Reardon ruled it this way: Vance was entitled to the base. Fewster and Herman were out. The inning was over. Well, that might not be the nicest story to tell about Herman on the 112th anniversary of his birthday. But, it does illustrate two important points about the man. He sure could hit, and he sure could do something to make you scratch your head. Herman, who moved with his family to southern California as an infant, batted .324 in a 13-year career that began in 1926. He hit 181 home runs and drove in 997 runs. He was never better than he was in 1930 for Brooklyn, when he batted .393 with 35 home runs, 130 RBI and 18 stolen bases. The 6-foot-4-inch left-handed batter played six seasons in Brooklyn, three in Cincinnati, two for the Chicago Cubs and one apiece for the Pittsburgh Pirates and Detroit Tigers. Babe retired after the 1937 season, to play minor league ball with the Hollywood Stars of the Pacific Coast League. In 1945, Babe made a brief comeback with Brooklyn. He batted .265 in 34 at-bats and hit one home run. Then, it was back to California where he had some business and other interests. Being so close to the movie industry, he picked up some work behind and in front of the cameras. Babe served as technical consultant on the Lou Gerhig movie Pride of the Yankees starring Gary Cooper in the title role. Herman even doubled as in some long shots on the baseball field. Herman worked as a scout for some teams and stayed in baseball until his death in 1987 at the age of 84. He never garnered any real Hall of Fame support, topping out at 5.7 percent of the vote in 1956. The truth was, though, that Herman never was much of a fielder. Managers put him into the line-up to hit. And, that he did. He always reminded the jokesters that, in that famous game in 1926, he not only drove in the winning run, he also drove in Brooklyn’s other two runs. Spence Abbott, a Major League scout, put it best when asked about Babe Herman. Abbott saw Herman playing for the Seattle Indians of the PCL in 1925. As usual, Herman was whacking line drives all over the place. Only a single off the superbly nicknamed Louis Nelson “Chicken” Hawks kept Dazzy Vance from throwing back-to-back no-hitters in the late summer of 1925. Vance tossed his no-no for the Brooklyn Robins (forerunner of the Dodgers) on Sept. 13 at Ebbets Field. He beat the Philadelphia Phillies 10-1 in the first game of a doubleheader. The Brooklyn ace, and reigning National League Most Valuable Player, struck out nine batters and walked one. The Phillies scored a run on two Brooklyn errors and a sacrifice fly. Milt Stock and Jimmy Johnson led the Brooklyn offense, with three RBI apiece. Just a few days before his no-hitter, on Sept. 8, Vance had tossed a one-hitter against those very same Phillies, also at Ebbets Field. In that start, Vance only got the bare minimum of support. He beat Philly 1-0 in a pitching duel with Ray Pierce. Jack Fournier knocked in the Robins’ only run, scoring Stock in the fourth inning on a base hit. Hawks, who was erased on a caught stealing, finished the game 1-for-3. 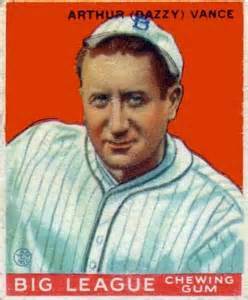 The first baseman from San Francisco batted .322 in 1925, his second and final year in the majors. Hawks broke in with the New York Yankees as a 25-year-old rookie in 1921 and hit a respectable .288 in 73 at-bats. The first baseman from San Francisco spent most of his long playing career in the minor leagues, in California and on the east coast. Following his two great starts, Vance raised his won-loss record to 22-8 and lowered his ERA to 3.32. He extended his no-hit streak to 16 innings until giving up a first-inning single to Max Carey of the Pittsburgh Pirates in his next start. The 6-foot-2-inch right-hander from America’s heartland (born in Iowa, raised in Nebraska) finished the 1925 campaign with a 22-9 mark and 3.53 ERA. He led the league in strikeouts, something he did every from 1922 through 1928, with 221 and in shutouts with four. Dazzy retired after the 1935 season with a 197-140 career won-loss record and was elected to the Baseball Hall of Fame in 1955. Congratulations to this select group of pitchers for being back-to-back magnificent. Cleveland’s Corey Kluber pulled off a Dazzy-ing performance against the Cardinals. They say that a record is made to be broken. Even a Dazzy Vance record. Cleveland Indians’ ace Corey Kluber struck out 18 St. Louis Cardinals on Wednesday evening at Progressive Field in Cleveland. No pitcher has ever fanned that many Redbirds in one game. Dazzy Vance held the previous mark with 17. Vance enjoyed his big game on July 20, 1925. The Brooklyn ace set his career-high mark that day in a 10-inning 4-3 win. Vance also tied the 20th century single-game strikeout mark. The Chicago Cubs’ Jack Pfiester punched out 17 hitters in 17 innings on May 30, 1906. 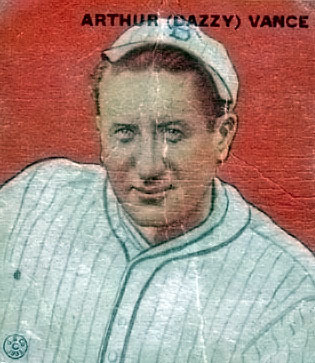 In 1925, Vance fanned 221 batters to lead the National League for the fourth straight season. He would go on to finish first in K’s for the next three years, giving him seven strikeout titles in his career and ensuring his place as one of the most dominant pitchers in baseball history. Kluber, meanwhile, continues to make his mark in baseball. Like Vance, Kluber is a late-bloomer. Dazzy really didn’t get things going until his age-31 season in 1922. Kluber, out of Coppell, Texas, near Dallas, is 29 years old. He attended Steton University in central Florida (home of the Hatters, of course) and didn’t make it to the majors until he was 25. Kluber pitched a bit in his first two seasons (2011 and 2012), with some crummy results. In 2013, he broke out with an 11-5 won-loss mark and a 3.85 ERA (99 ERA+). Last season, he really hit the mark, going 18-9 with a 2.44 ERA (155 ERA+) and taking home the A.L. Cy Young Award. The 2015 season began in a rough way for Kluber. He went 0-5 in his first seven starts with a 5.04 ERA. Then on Wednesday, he pitched one of the best games in baseball history. The Cardinals’ Jhonny Peralta broke up Kluber’s no-hit bid with a single to center field with two outs in the seventh inning. Kluber’s 18 strikeouts tied Bob Feller for the most strikeouts in one game by an Indians pitcher and were the most by any pitcher in the Majors since the Milwaukee Brewers’ Ben Sheets fanned 18 on May 16, 2004. He certainly mixed things up. Everything was working against the Cardinals. Kluber struck out six batters on curveballs, four on his four-seam fastball, four on his sinker and three on his slider. Kluber’s game score of 98 was the best in history for any pitcher in an eight-inning performance. (50 is average.) 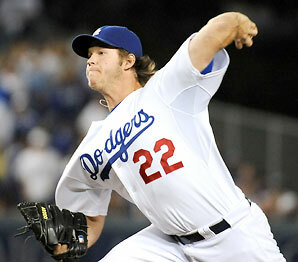 The Los Angeles Dodgers’ Clayon Kershaw is the last pitcher to exceed a 98 game score, recording a 102 on June 18 last season in his 15-strikout, no-walk no-hitter against the Colorado Rockies at Dodger Stadium. Kerry Wood is the only other pitcher with a game of 18 or more strikeouts, no walks and no more than one hit. Wood did that for the Cubs, against the Houston Astros, on May 6, 1998. He went the whole way, gave up a hit and struck out 20. Cleveland Manager Terry Francona pulled Kluber after eight innings and 113 pitches. The starter had to watch Cody Allen, with a high-flying ERA of about 9.00, get the final three outs and preserve a 2-0 masterpiece.